If yes, how you are going to pop the question is a big decision. The story of your proposal will be told over, and over again, and possibly captured on video forever. No pressure! A creative proposal can be memorable and fun, so be sure to plan out all the details and possible scenarios. 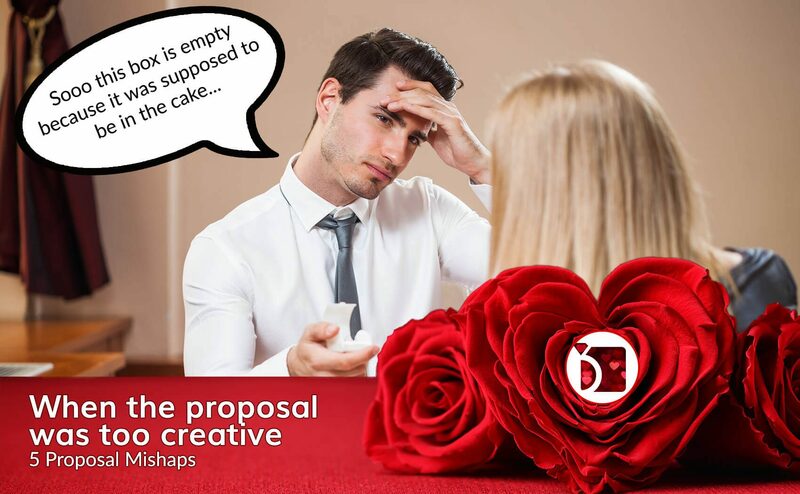 A proposal that is too creative can easily become a proposal blunder. Do you get air sick when you fly? Probably one thing to consider if you are planning a romantic proposal on a small plane. This proposal mishap included the young man getting air sick the instant he popped the question and tossing his cookies as they say. She said yes and handed him a towel. A man was proposing to his girlfriend in Times Square NYC and dropped the ring 8 feet down a utility grate. The couple reached out to NYPD officers for help, but ring was not able to be found that day. NYPD officers returned the next day and were able to find the ring. Although the couple did not leave their contact information, a Twitter post reconnected the happy couple with the found ring. Way to go NYPD! Planning on an underwater proposal can be tricky, so this groom to be decided to write his proposal in a card, the only problem was the ocean water destroyed the card before she could read it. She did say yes, once she knew the question. A first time skydiver planned to propose when he landed and got down on one knee in front of his bride to be, unfortunately the weather did not cooperate and the dive was cancelled, but the proposal still took place with a little less of a grand entrance on the airfield parking lot, but she still said yes. Last but not least, if you plan on making a very public proposal, you may want to be sure the answer is going to be “Yes”. This young man proposed on the basketball court at a televised NBA game and she said no. The mascot walked him off the court. Poor guy! Remember, MyJewelryRepair.com can provide ring sizing before or after your proposal with our easy to use online, mail-in process.